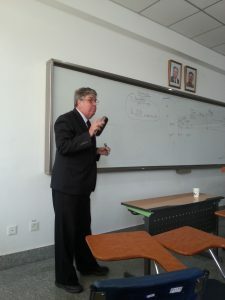 Pyongyang University of Science and Technology continues our research lecture series with a presentation from Dr. Glenn Wehtje, research agronomist at Auburn University (USA). Glenn spoke about his research in herbicides and weed control methods. He specifically outlined three different projects and how he carefully designed the experiments to maximize his data collection efforts, how he measured the response variables, how he analyzed the data using sophisticated statistical methods, and how he interpreted the results. He also discussed the practical implications of each of these three projects. Overall, it was a well-rounded presentation based upon theory, yet loaded with practical applications.